The USB-16COMi-M industrial USB to 16-Port RS-422 485 Serial adapter for adding more serial communication devices to your system environment. Adds 16 RS422 or RS-485 DB-9 Male Serial Ports to your system. DIP Switches allow the control of serial signal to ports, no need to open the adapter chassis. Application use may include retail and industrial applications, data collection and other high speed applications. The USB-16COMi-M USB to 16-Port RS-422 485 Serial Adapter is designed for industrial applications and environments making your user experience more efficient when it comes to serial port expansion. The USB 16COM Serial Adapter instantly adds sixteen (16) RS-232 serial communication ports to your system. Plug-and-Play installation with hot plug features set the adapter up for automatic detection for use as a COM port. There are no IRQ & COM port conflicts or configuration needed, since the ports do not require any additional IRQ, DMA, memory as resources on the system. The adapter has a built-in switching power supply of 100V/240V (input) inside the chassis. DIN rail brackets for an industrial mounting environments are included for mounting to a 19 inches rack, and the rack mount kits are included with the adapter. 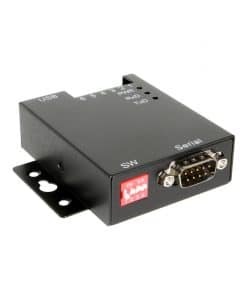 The USB 16COM Serial Adapter provides instant connectivity with modems, ISDN TAs, PDAs, handheld & pocket PCs, digital cameras, POS, serial printers. It is suitable for remote access, retail and industrial applications, data collection and other applications requiring high speed RS-232 serial communication ports. There is no need to open the chassis to set the operation modes since the 16 DIP switches are located externally (pictured above) for easy RS-422, RS-485 mode settings. The 16 port RS422/485 serial adapter has certain accessories that work with it. These accessories are what you can order if needed. Did you misplace or break a part that came with your 16 port RS422/485 serial adapter? Purchase it here!